Just because you’re interested in building a tiny house doesn’t mean you have to sacrifice comfort. Our tiny house plans are blueprints for houses measuring 600 square feet or less. If you’re interested in taking the plunge into tiny home living, you’ll find a variety of floor plans here to inspire you. There are many reasons one may choose to build a tiny house. Downsizing to a home that’s less than 600 square feet or even 500 square feet or less comes with a number of benefits, some of which are more obvious than others. • Tiny homes are more environmentally friendly. Fewer building materials means a reduced impact on the environment. With more and more people becoming conscious of their environmental impact, downsizing to a tiny house is a great way to reduce their carbon footprint. • Similarly, these houses are much more energy efficient thanks to their small size. Reduced electricity and gas usage means lower energy bills and a greener living environment — a win-win all around! If you're looking for a "green" home that has a little more square footage, check out our eco friendly home designs. • This type of home is much easier to maintain and clean. With less space and fewer items in the home, the amount of time spent sweeping, dusting, mopping and making repairs is greatly reduced. • These homes also deter excessive consumption. Since there’s less room to collect things, the size of the home is an effective deterrent for shopaholics and those who tend to hoard unnecessary items. • Finally, tiny homes are less expensive to build. Even tiny house blueprints cost less than standard house plans, which is attractive for financially conservative folks. With less room to collect things and fewer things to worry about maintenance- and money-wise, living in a tiny home allows you to shift your focus to more important things, such as travel, family and friends, and hobbies. In other words, the things that really matter. As many benefits as there are to living in a tiny home, many people may be put off by the idea of moving into such a small space. However, making the move to a micro house doesn’t mean you have to sacrifice comfort and quality. Our tiny house plans offer ample living space and style without all the excess. 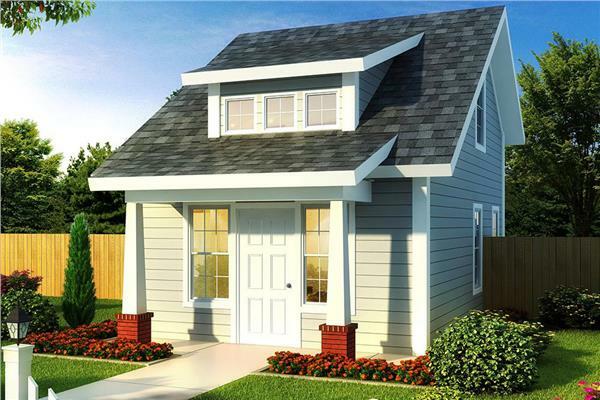 You’ll find house plans with garages, porches, two bedrooms, second floors, and basements. Anything you’d want in a standard home, we have in a tiny house plan for you. Browse our collection below to find the home of your dreams.